Hematite, famous modernly for the steel-grey jewelry often made from it, is more commonly a rust-red ore when found in mining iron. A iron oxide (Fe2O3), hematite’s name comes from haema, the Greek word for blood, and most of its direct historical impact comes from that red form. While hematite is incredibly common – the most common form of iron ore – even in ancient times it was appreciated for itself, and not only for the metal it could produce. 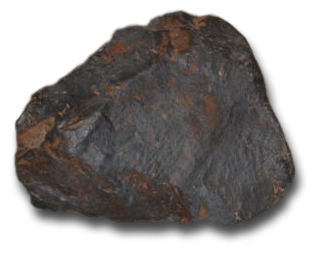 In modern times, magnets are used to harvest hematite from mine tailings. Red hematite most commonly possesses an earthy luster, appearing anywhere from rust-colored to Powdered red hematite is also known as rouge. Perhaps most famous as a cosmetic used for centuries to redden the skin, it is the same substance as jeweler’s rouge, used to polish metal and gemstones, and also frequently used to help strop a barber’s straight razor. Red ochre and yellow ochre painting pigments also owe their color to a mixture of red hematite and clay – unhydrated in red ochre, and hydrated in yellow. Maybe most strikingly, hematite is the basis of red chalk, and red chalk drawings have many prominent places in human history and the history of art, including the sketches of Leonardo DaVinci, the body painting of corpses in paleolithic cultures one hundred and sixty to eighty thousand years ago, and numerous cave paintings dating back as much as forty thousand years. Red chalk mines dates back as far as 5000 BCE. Grey hematite, unlike the “bloodstone” variety that gave it its name, has a metallic luster, and can appear almost like a dark mirror when sufficiently polished. Faceted, it appears nearly black, and smooth, it has a gray, lustrous tone similar to a black pearl. Used as a gemstone in jewelry, for gilding, or for carved intaglios, it was especially popular in Victorian England, and is still used today, in part because it is common enough to be relatively affordable. In its more jewel-like form, it has been sought after for over two millennia, since the Etruscans found deposits of it on the island of Elba. Outside of iron mines, hematite is commonly found in banded iron formations, hot springs, clay banks, and other places where iron interacts with water (or more rarely, without water, as a result of volcanic activity). Whether grey or red, it always leaves a red streak (and a grey stone leaving a red streak is often striking and startling to students in the lab seeing it for the first time). 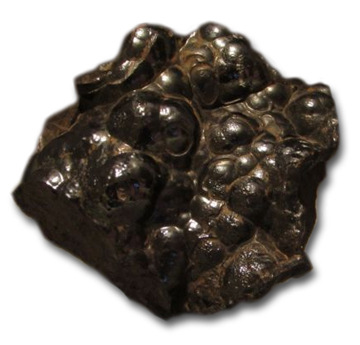 Hematite often contains enough inclusions of magnetite to appear attracted to magnets, however, hematite itself is only weakly ferromagnetic when encountered at room temperature. Its specific magnetic properties are variable in peculiar ways depending on the scale of the hematite crystal, and its small magnetic moment, as well as the temperatures at which it transitions from antiferromagnetic to paramagnetic, have been the subject of much discussion since the 1950s (and as such, could make up an essay – or many scholarly papers – of their own). This entry was posted in The Conglomerate and tagged hematite, rock on October 19, 2016 by NDrockclub.